As IT departments evolve into service delivery organizations there’s a need to align cloud service spend with business results. Measuring the impact of application performance on the business is critical. Beyond measurement, the ability to adjust infrastructure strategies on the fly in programmatic fashion is the piece of the puzzle that NS1 is aiming to address. The company is on target with its offering. The combination of cloud and CI/CD adds up to this: a set of applications, running remotely, that can change frequently – sometimes automatically – depending on telemetry gleaned from real-world usage. It’s a complicated situation to track. One of the technology solutions to address these complexities is DNS. 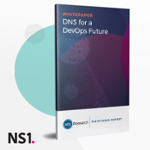 DNS can be leveraged for application delivery and management in a way that doesn’t require extensive retooling of applications, and is also cost-effective in terms of operating expenses. it may trigger some new ideas in your organization about how DNS can help you move forward with your plans for digital transformation. You can read more about NS1's Automation and DevOps solutions here.